Most of us have done it at one time or another: kept an unsightly junk drawer that we dare not open unless we’re amongst our closest family members or our cat. Except that you’re not sure when you last put those ketchup packets in that drawer, and you don’t quite have a use for all those broken paperclips. It’s time to make that drawer a thing of beauty. 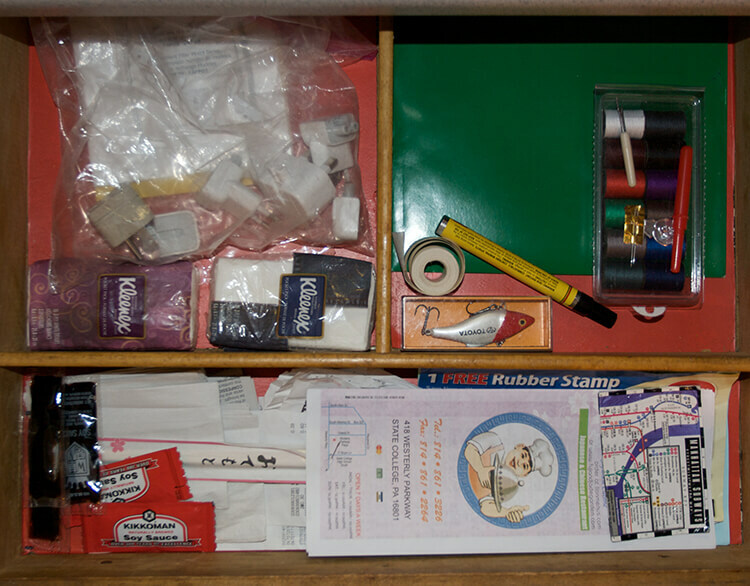 Organizing a junk drawer is one of those activities that can make you feel great. To see the drawer change from cluttered and useless to clean and orderly is a great feeling. I promise that it won’t be that bad, and you’ll never feel distressed about opening it again. Let’s learn how to organize your junk drawers. Before you begin, you need to decide what you’re going to do with your kitchen junk drawer because it can’t stay the same way. If you’d like to keep the essentials because there’s no other place to put them, it’s okay to store them in the same drawer, but you’ll need some dividers to make your drawer look nicer and to keep everything organized. The key to storing multiple items is to have an order. In this manner, you can create sets of like things. This will help you find these quicker over time. Before you can begin sorting through all of your “junk,” you’ll need to take it out of the drawer. Next, clean out the drawer. Wipe it down with a damp rag that has a little bit of dish soap on it. You don’t want to soak your drawer because you’ll need to put everything back, and you don’t want to develop mold or mildew. Dish soap helps to remove grease efficiently. If you have more significant grease spills, window cleaner or vinegar is good at removing them. If you own your home, think of possibly painting your drawer or placing a nice liner in it. Decide on a use for everything. If things don’t have a purpose, don’t keep them. Don’t hold on to things because you’ll “use it one day” either. Be realistic about what you’re going to use and what you don’t need. Divide everything into piles, and make sure to throw away anything you’re not going to use. Useful items your drawer can store are scissors, pens, notecards, a recipe holder, chip clips, twist ties, baggies, and other kitchen essentials. If you’re going to keep condiment packets, make sure you keep a permanent marker in the drawer nearby. Write the dates on the packages when you first get them. That way you won’t eat something questionable at a later point. Now that you know how many piles you have, what you want to store in the drawer and the rough dimensions of each group, it’s time to find storage solutions. Some people use utensil holders, others opt for slots of wood, but you can find many small plastic containers for your items at just about any store. If you have particularly small items to sort, ice cube trays are useful. Plastic baggies in a small container can be used to file your coupons. Use a permanent marker on the outside of the baggies to write things like “household essentials.” In this way, you’ll know where your coupon for bleach or detergent is. Make sure that all of your containers or dividers will fit in the drawer. You can make sure of this by measuring the dimensions of the drawer and either mentally visualize each container’s layout, or add up the sizes of the boxes to play Tetris at a later point. Here’s where the drawer begins to look extra spiffy. Put all your piles into their respective containers. Place the containers in the drawer and organize them to your heart’s content. It’s tempting just to keep staring at the drawer but close it. Lighter or Matches – When the power goes out you need to know where to find these to light your candles. You don’t want to be pawing your way around the house looking for them. Flashlight – same reason as above but also for when you need to look in dark corners and crevices. This happens quite often, actually! Pencils and Pens – If it is like my house, your drawer could be filled with these if not careful. Be sure to put the excess in a proper place, like a desk organizer. Simple tools – A small claw hammer, a Philips and Flat-blade screwdriver are always in need. Put them here so you won’t have to search for them. Scissors or a box cutter – Another handy tool when you want to open that package from Amazon, right now! >Post-it notepad – When you need to make a list before you forget (like grocery items you just ran out of). Tape measure or ruler – Handy when you want to hang a picture, measure a rug or see how tall your kid is today. Don’t go all the way out to the garage and get Dad’s industrial-sized tape measure, use Mom’s petite one instead. Super glue / tape – Another often used set of items. Usually when something breaks you are already frustrated and don’t want to search the whole house to glue it back together. Batteries – When the remote dies and you need to rewind what Sheldon said on the Big Bang Theory, you’ll know immediately where to find replacements. Chip clips – Don’t put these items in a place you will forget, otherwise the kids will just forgo using it and your chips will spill or attract pests. Buy a lock so that your drawer will stay in its newly pristine condition. Just kidding, but you will need some self-control not to allow it to revert to messier days. Any time you come across condiment packets, new twist ties or anything else that belongs to your “piles,” you will need to sort them accordingly. Every month, take a gander at your drawer and toss anything that is unnecessarily crowding your drawer or old condiment packets that you would find unappetizing to consume. Regular maintenance of your junk drawers is critical, so don’t allow yourself to slip into old habits. You’ll find that you keep a much more organized home when you take care of it regularly. Waiting until things get bad creates a mess that demands an exorbitant amount of time to tackle. If the rest of the house intimidates you, take a look at your organized drawer, and remember your beautiful undertaking. This content is licensed under CC BY 4.0. If you use this content please attribute Philip Page via https://yardandgarage.com/ as a contributor of your adapted content.